As we approach the new millennium, the pattern of diet and disease across the globe is rapidly changing face. In the first half of this century, the world's richer nations successfully grappled with nutrient deficiencies and infectious diseases, only to be faced in the second half with an onslaught of "diseases of affluence". These diet-related, noncommunicable, chronic diseases, including coronary heart disease, cancer, stroke, diabetes and obesity. In recent decades, the tide has turned. 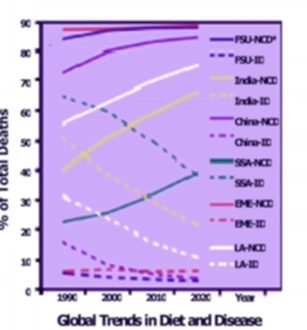 As industrialized nations experience dramatic downturns in the overall burden of noncommunicable diseases (NCDs), many developing countries are facing epidemics of the diseases of affluence alongside the traditional diseases of poverty (e.g., nutrient deficiencies, infections and childhood malnutrition). In short, according to the 1998 World Health Report, "The war against ill-health in the 21st Century will have to be fought simultaneously on two fronts: infectious disease and chronic noncommunicable disease." Ironically, diet and nutrition play a key role on both fronts. The global picture is increasingly clear: Today, a male born in sub-Saharan Africa has a higher probability of dying from an NCD than a male born in the United States. In fact, by 1990, coronary heart disease had already become the established leading cause of death worldwide. And in 1996, more than 60 percent of the 15 million worldwide deaths due to diseases of the circulatory system occurred in the developing world, with an additional 15 percent occurring in the transition economies of Central and Eastern Europe (CEE). Similarly, 60 percent of the cancer deaths in 1996 took place in the developing world. Judging by the relative burden of diseases of poverty versus diseases of affluence, the market economies of North America, Western Europe, Japan and Australasia, along with some countries in CEE, have completed the epidemiological transition that accompanies industrialization and increases in gross national product. Rising cardiovascular mortality and decreasing life expectancy in much of CEE until recent years, however, suggest that the transition in this region is still underway and that diet (along with alcohol and tobacco) is a key factor in the divergence between East and West mortality rates. (See "Insider's View,") In China, Latin America and the Caribbean, NCDs already cause a higher burden than infectious and childhood diseases. South Asia, the Middle East and sub-Saharan Africa, in comparison, remain at an earlier stage in the transition. In the developing world, NCDs tend to emerge first in influential societal groups that embrace an affluent "Western" lifestyle, and their treatment is prohibitively expensive. As the epidemiological transition progresses, the rapid spread of NCDs will become great cause for alarm, especially since their treatment has to compete with their prevention to compete with prevention of diseases of poverty in developing countries. Genes, gender and age are important determinants of whether an individual will eventually develop chronic diseases; but powerful external determinants of NCD risk also lie in a population's environment and lifestyle. Of these external factors, diet (second only to tobacco) commands center stage. So, while NCDs account for almost 40 percent of all deaths in the developing world, nutrition -- or, more specifically, the lack of good nutrition -- directly contributes to their high incidence. As developing countries around the world trade in agriculture for cityscapes, the health of their populations worsens. Their traditional reliance on plant foods diminishes; at the same time, attention and appetites are turned to meat, fat and animal products, which are more readily available, affordable and acceptable. While this influx of dietary energy may help to reduce the burden of malnutrition in developing countries, the accompanying saturated fats, cholesterol and sugars in these "affluent diets" significantly increase the incidence of NCDs. For example, diabetes is now six to 10 times more prevalent in India's urban populations than its rural ones, because the majority of urban residents currently get almost one-quarter of their daily energy from fats, oils and milk products and consume about one-third less cereals than their rural neighbors. A diet high in saturated fats and low in plant foods is a well-established risk factor for atherosclerosis, coronary heart disease, hypertension and several forms of cancer. In addition, such dietary patterns are associated with obesity, especially in urban areas, which tend to be devoid of physical activity, especially among the more privileged classes. (e.g., A 1997 report by the Nutrition Foundation of India Studies revealed that half the "high middle-class" women in India are overweight.) In short, while the culinary and industrial enhancement of the energy density of foods by adding fats and sugars is essential in times of need, it is inherently disadvantageous in times of plenty, and tends to lead to inadvertent, and decidedly harmful, "passive overconsumption." Fortunately, much is known about the importance of a nutritionally sound diet in early life to prevent malnutrition, as well as the role healthy dietary patterns in later life can play in minimizing the risk of the diseases of affluence, as well as the diseases of poverty. Prevention is easier said than done. While the established market economies of North America, Western Europe, Japan and Australasia have made progress, most developing countries are still trying to cope philosophically and financially with the challenge of diet-related NCDs. In 1990, for example, sub-Saharan Africa and India had the largest proportion of the world's disease burden (around one-fifth each), yet their spending on health accounted for a tiny proportion of global expenditure -- 0.7 and 1.0 percent respectively. The established market economies, in comparison, accounted for 7 percent of the disease burden, but 87 percent of the world's health budget, reveal C.J.L. Murray and A.D. Lopez in their 1996 Global Burden of Disease Series. Most industrialized countries have learned too late that preventing NCDs is much more cost-effective than treating them. Developing countries, including China, Latin America, the Caribbean, South Asia, the Middle East and sub-Saharan Africa, still have the luxury to learn from others' mistakes. But time is ticking. Their challenge lies in addressing high infant and childhood mortality rates, while simultaneously battling the growing epidemic of diet-related chronic diseases. International institutions and national governments must recognize this dilemma and embrace national nutrition policy that encompasses both issues. In part this means the push for NCD prevention in developing countries, including the promotion of good maternal and infant nutrition, lifelong healthy eating and active lifestyles, which will ultimately cost less and bear more fruit. The sooner such measures take root, the greater the impact -- and the lower the death toll -- will be. China, like many of its Asian neighbors, is in the throes of a rapid epidemiological transition. In recent decades, the major causes of disease and death in China have shifted from predominantly infectious and diet-related deficiency diseases to diet-related, noncommunicable diseases such as coronary artery disease, cancer, osteoporosis and diabetes. Although nutrient deficiencies and infectious diseases have yet to be eradicated, in 1996, 66 percent of the total deaths in China were caused by chronic diseases, and this number rose to 76 percent in urban areas. What can explain this dramatic shift in national disease patterns? In 1983, researchers from Cornell University, Oxford University and the Chinese Academy of Medical Sciences jointly launched a longitudinal study of diet, lifestyle and disease mortality in 130 villages in 65 counties of rural China. They examined a wide variety of dietary, lifestyle and biochemical characteristics in 6,500 subjects aged 35 to 64 years, exploring, among other things, the correlation between mortality and specific diseases clustered geographically into two groups -- diseases of poverty (e.g. dietary deficiencies) and "diseases of affluence" (e.g. most chronic diseases). The chief correlate of diseases of affluence was found to be plasma cholesterol levels, which ranged from 86 to 181 mg/dl, even though the average county mean was a low 127 mg/dl. And, further analysis of the data revealed that a higher plasma Apo B lipoprotein level (a risk factor for atherosclerosis) meant higher consumption of meat and total fat, and lower consumption of legumes and certain dietary fibers. These findings are consistent with food consumption patterns in China, which have changed dramatically over the past two decades, in keeping with economic development. From 1978 to 1987, the Chinese national food disappearance data showed a two-fold increase in Chinese meat consumption and an almost three-fold increase in the nation's egg and fat and oil consumption. China's National Nutrition Survey revealed a similar trend, finding that between 1982 and 1992 cereal and tuber consumption decreased by 12 and 47 percent respectively, while meat, egg and fat and oil consumption jumped 38, 60 and 61 percent. In fact, by 1992, the contribution of fat to total dietary energy had reached 28.4 percent nationwide, and in big cities such as Beijing and Shanghai, fat intake has exceeded 30 percent of total dietary energy in recent years. Although plants, legumes and grains still comprise the lion's share of most Chinese diets, meat consumption is becoming fashionable -- its increase spurred by consumer belief that high meat consumption conveys status and is a symbol of better life. A corresponding rise in national income levels and meat production also has encouraged consumption by making meat more affordable, and available. And meat is marketed as nutritious, thus adding to its attraction. China is a seminal example of the phenomenon that even a moderate change in lifestyle and dietary patterns can --- and does -- cause a significant epidemiological shift. A populous nation with the economy of an industrializing country and the overall disease patterns of a developed one, China may also become a global paragon as it progresses in taking decisive action to curb its diet-related disease epidemic through the Chinese Nutrition Society's national dietary guidelines to promote health and reduce disease.